I had an old 20 gallon aquarium I was getting rid of that was still full of water. I brought a shop-vac over to the counter that the aquarium was sitting on but the hose was too short. I took the hose off and opened the lid to the shop-vac’s reservoir. I put the hose into the aquarium and figured I could start a siphon with my mouth and then aim the water into the bucket. I underestimated the speed of gravity. I just barely started the water moving through the hose when I felt like someone had punched me in the face. I was stunned for a moment as gallons of water enveloped my head and poured onto the floor before I regained my senses and steered what was left into the bucket. Oooh shiny special effects this time. I don’t know about you guys, but when I first saw the picture, my initial split-second reaction was that it was some kind of religious figure. And thus Biff gets ‘sucked’ into the past. one of life’s great disapointments is finding out nothing special happens when you try to combine two vacuums. dude… if stuff like that actually worked, my bedroom would be a science lab. n i have a feeling a lot more would be screwed up because of it. like the space-time continuum. First thing I thought when seeing this panel about an hour ago: The scene in National Lampoon’s Christmas Vacation, with the over-dramatic plugging-in of the lights, followed by an angel’s chorus. Then I read the text, and laughed so hard I forgot all about my initial thought until just now. Don’t cross the beams, Biff! 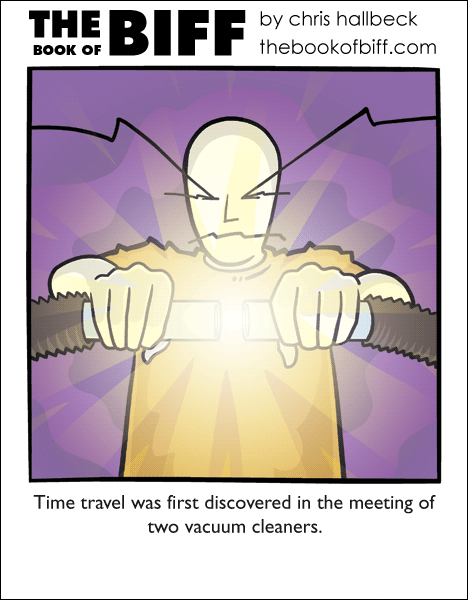 i… i have to try this now, i know i wont time travel but i must know what happenes when 2 vaccum’s meet! Good Lord, that’s the most badass comic I’ve seen in quite some time. I just wanted to let you know that I particularly enjoyed the imagery in your post today. I feel like I need a shower just from reading it. i always wondered what would happen if you did that. Anyone ever try this with two leaf blowers? if you can keep them together, it’s weird..
Or in Back to the Future, when Doc Brown couples two wires together just as lightning strikes. Perhaps the Doc traveled to this day for his inspiration. you like to live on the bleeding edge, don’t you? When I was kid, we could always tell when my father was changing out the water in his aquariums. he used a siphon, you see, so when we heard coughing, swearing and retching, followed by the clear rush of water hitting the bucket, we knew exactly what was happening. Siphoned water is always faster than you expect. This is why I clean my aquarium with a turkey baster. It’s slower, but it’s safer. Almost wet my pants I laughed so hard when I read the text. I would have loved to see that in person. Dang, now I feel inclined to try that..
lol! I was wow’d by the epicness of this comic! But the shiny hurt my eyes, which doesn’t explain why i want a wallpaper? Seriously I wallpaper would be awesome. If you don’t make it, its no big as it dose hurt my eyes. What Biff fails to realize is that he’s also going 88 mph! That Biff cracks me up he does. Important safety tip: Don’t cross the streams!! @speearr thats actually not right.. a clock does not measure time it measures itself..
@-2! I laughed as well, hopping is also good exercise. I’d love to try this if I didn’t have an irrational fear of vacuum cleaners.. This is by far my favorite panel so far. No! don’t cross the streams! I dunno why, but I allways love this consept that regular everyday objects can be twisted in some idiotic manner to produce the most grandurous events. I’d go off to try this, but my future self said it didn’t work. Remember that due to the very nature of time travel it was discovered at all times simultaneously.